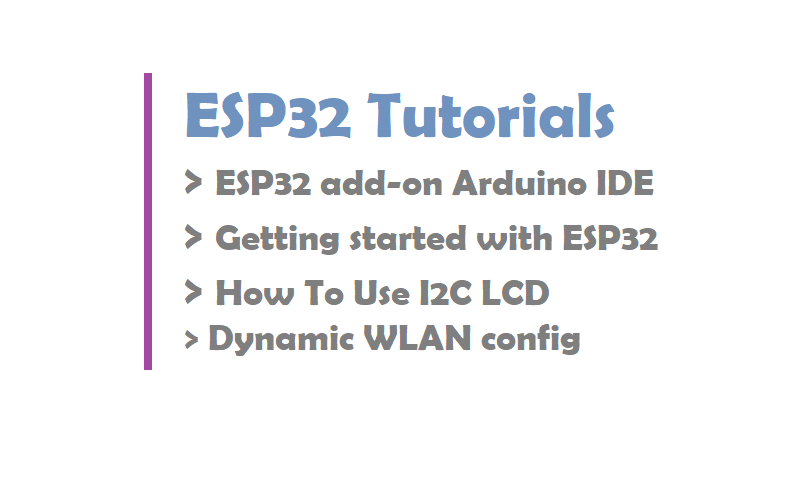 In the post you can explore some esp32 tutorials. This is for beginners. Esp32 And ESP8266 both most popular development boards. ESP32 and ESP8266 are cheap Wi-Fi modules perfectly suited for DIY projects in the Internet of Things (IoT) field. These modules come with GPIOs, support for a variety of protocols like SPI, I2C, UART, and more. The best part is that they come with wireless networking included, which makes them apart from other micro-controllers like the Arduino. This means that you can easily control and monitor devices remotely via Wi-Fi for a very low price. The ESP32 is dual core, this means it has 2 processors. It has Wi-Fi and bluetooth built-in. It runs 32 bit programs. The clock frequency can go up to 240MHz and it has a 512 kB RAM. This particular board has 30 or 36 pins, 15 in each row. It also has wide variety of peripherals available, like: capacitive touch, ADCs, DACs, UART, SPI, I2C and much more. It comes with built-in hall effect sensor and built-in temperature sensor. Here you can see a table that adapted by AMICA IO. This table shows main differences between the ESP8266 and the ESP32 processors (table adapted from: AMICA_IO). You can set PWM signals in any GPIO with configurable frequencies and duty cycles set on the code. When it comes to the analog pins, these are static, but the ESP32 supports measurements on 18 channels (analog-enabled pins) versus one 10-bit ADC pin on the ESP8266. The ESP32 also supports two 8-bit DAC channels. Additionally, the ESP32 contains 10 capacitive sensing GPIOs, that detect touch and can be used to trigger events, or wake-up the ESP32 from deep sleep, for example. If you’re familiar with the ESP8266, the ESP32 is its sucessor. The ESP32 is loaded with lots of new features. The most relevant: it combines WiFi and Bluetooth wireless capabilities and it’s dual core. Some Boards comes with LoRa such as WiFi LoRA 32 (V2) ESP32 | Overview | Introduction. The Arduino integrated development environment (IDE) is a cross-platform application (for Windows, macOS, Linux) that is written in the programming language Java. It is used to write and upload programs to Arduino board. This IDE allows for program writing, code verfication, compiling, and uploading to the Arduino development board. Libraries and example code will also be installed. The Arduino IDE supports the languages C and C++ using special rules of code structuring. The Arduino IDE supplies a software library from the Wiring project, which provides many common input and output procedures. User-written code only requires two basic functions, for starting the sketch and the main program loop, that are compiled and linked with a program stub main() into an executable cyclic executive program with the GNU toolchain, also included with the IDE distribution. The Arduino IDE employs the program avrdude to convert the executable code into a text file in hexadecimal encoding that is loaded into the Arduino board by a loader program in the board’s firmware. If you have a reliable Internet connection, you should use the online IDE (Arduino Web Editor). It will allow you to save your sketches in the cloud, having them available from any device and backed up. You will always have the most up-to-date version of the IDE without the need to install updates or community generated libraries. If you would rather work offline, you should use the latest version of the desktop IDE. 5) That’s it. It should be installed after a few seconds. If this is your first time installing the ESP32 on Arduino IDE you can ignore this section. If you’ve followed the older installation procedure and you’ve manually installed the ESP32 add-on with Git GUI, you need to remove the espressif folder from your Arduino IDE. 6) Press the Upload button in the Arduino IDE. Wait a few seconds while the code compiles and uploads to your board. 7) If everything went as expected, you should see a “Done uploading.” message. // initialize digital pin ledPin as an output. In this code, we’re controlling an LED connected to GPIO 23. 1) Go to Tools > Board, scroll down to the ESP32 section and select the name of your ESP32 board. In my case, it’s the DOIT ESP32 DEVKIT V1 board. 2) Go to Tools > Port and select a COM port available. 3) Press the upload button. If you get the following error when trying to upload code, it means that your ESP32 is not in flashing/uploading mode. After that, you should see the “Done uploading” message. That’s it. After uploading the new sketch, you can press the “ENABLE” button to restart the ESP32 and run the new uploaded sketch. After uploading the code, the LED connected to GPIO 23 should be blinking every other second. For this tutorial we’ll be using a 16×2 I2C LCD display, but LCDs with other sizes should also work. The advantage of using an I2C LCD is that the wiring is really simple. You just need to wire the SDA and SCL pins. This display uses I2C communication, which makes wiring really simple. Wire your LCD to the ESP32 by following the next schematic diagram. We’re using the ESP32 default I2C pins (GPIO 21 and GPIO 22). You can also wire your LCD to the ESP8266 by following the next schematic diagram. We’re using the ESP8266 default I2C pins (GPIO 4 and GPIO 5). Before displaying text on the LCD, you need to find the LCD I2C address. With the LCD properly wired to the ESP32, upload the following I2C Scanner sketch. After uploading the code, open the Serial Monitor at a baud rate of 115200. Press the ESP32 EN button. The I2C address should be displayed in the Serial Monitor. In my case the address is 0x27. If you’re using a similar 16×2 display, you’ll probably get the same address. Displaying static text on the LCD is very simple. All you have to do is select where you want the characters to be displayed on the screen, and then send the message to the display. Here’s a very simple sketch example that displays “Hello, World!“. It displays the message in the first row, and then in the second row. In this simple sketch we show you the most useful and important functions from the LiquidCrystal_I2C library. First, you need to include the LiquidCrystal_I2C library. The next two lines set the number of columns and rows of your LCD display. If you’re using a display with another size, you should modify those variables. Then, you need to set the display address, the number of columns and number of rows. You should use the display address you’ve found in the previous step. In the setup(), first initialize the display with the init() method. Then, turn on the LCD backlight, so that you’re able to read the characters on the display. To display a message on the screen, first you need to set the cursor to where you want your message to be written. In the following line, we set the cursor to the first column, first row. Then, you can finally print your message on the display using the print() method. We wait one second, and then we clean the display with the clear() method. After that, we set the cursor to a new position: first column, second row. And then, the process is repeated. This example works well to display static text no longer than 16 characters. An Arduino library available for ESP8266/ESP32 WLAN configuration at run time with web interface. It is no needed hard-coding in advance the SSID and Password into the sketch to connect between. ESP8266/ESP32 and WLAN. You can input SSID & Password from a smartphone via the web interface at runtime. To the dynamic configuration for ESP32 for joining to WLAN with SSID and PSK accordingly. It an Arduino library united with ESP8266WebServer class of ESP8266 or WebServer class of ESP32. Easily implementing the Web interface constituting the WLAN for ESP8266/ESP32 WiFi connection. With this library to make a sketch easily which connects from ESP8266/ESP32 to the access point at runtime by the web interface without hard-coded SSID and password. Most simple approach to applying AutoConnect for the existing sketches, follow the below steps. The current upstream at the 1.8 level or later is needed. Please install from the official Arduino IDE download page. This step is not required if you already have a modern version. AutoConnect targets sketches made on the assumption of ESP8266 Community’s Arduino core. Stable 2.4.0 or higher required and the latest release is recommended. Also, to apply AutoConnect to ESP32, the arduino-esp32 core provided by Espressif is needed. Stable 1.0.1 or required and the latest release is recommended. Install third-party platform using the Boards Manager of Arduino IDE. You can add multiple URLs into Additional Board Manager URLs field, separating them with commas. Package URL is https://dl.espressif.com/dl/package_esp32_index.json for ESP32. The PageBuilder library to build HTML for ESP8266WebServer is needed. To install the PageBuilder library into your Arduino IDE, you can use the Library Manager. Select the board of ESP8266 series in the Arduino IDE, open the library manager and search keyword ‘PageBuilder‘ with the topic ‘Communication‘, then you can see the PageBuilder. The latest version is required 1.3.2 later. By adding the ArduinoJson library, AutoConnect will be able to handle the custom Web pages described with JSON. Clone or download from the AutoConnect GitHub repository. hen in the Arduino IDE, navigate to “Sketch > Include Library”. At the top of the drop down list, select the option to “Add .ZIP Library…”. Open the Arduino IDE, write the following sketch and upload it. The feature of this sketch is that the SSID and Password are not coded. The above code can be applied to ESP8266. To apply to ESP32, replace ESP8266WebServer class with WebServer and include WiFi.h and WebServer.h of arduino-esp32 appropriately. After about 30 seconds, if the ESP8266 cannot connect to nearby Wi-Fi spot, you pull out your smartphone and open Wi-Fi settings from the Settings Apps. You can see the esp8266ap in the list of “CHOOSE A NETWORK…”. Then tap the esp8266ap and enter password 12345678.A something screen pops up automatically. This screen displays the current status of the established connection, WiFi mode, IP address, free memory size, and etc. Also, the hamburger icon is the control menu of AutoConnect seems at the upper right. By tap the hamburger icon, the control menu appear. Here, tap “Configure new AP” to connect the new access point then the SSID configuration screen would be shown. Enter the SSID and Passphrase and tap apply to start connecting the access point. After connection established, the current status screen will appear. It is already connected to WLAN with WiFi mode as WIFI_AP_STA and the IP connection status is displayed there including the SSID. For one, continues execution of the sketch while keeping this connection. You can access ESP8266 via browser through the established IP address after cancel to “Log in” by upper right on the screen. Or, “RESET” can be selected. The ESP8266 resets and reboots. After that, immediately before the connection will be restored automatically with WIFI_STA mode. The IP address of ESP8266 would be displayed on the serial monitor after connection restored. Please access its address from the browser. The “Hello, world” page will respond. It’s the page that was handled by in the sketch with “on” function of ESP8266WebServer. Which are Board Supported ? And other ESP8266/ESP32 modules supported by the Additional Board Manager URLs of the Arduino-IDE. I hope you like this post “ESP32 Tutorials”. These ESP32 tutorials for beginners. If you want explore more ESP32 Tutorials Click Here. Do you have any questions? Leave a comment down below! ← InfluxDB | Installation | How To Use | Time Series Database ?